With a busier part of the year for work, I have not been able to look closely at the next few teams Butler will play in the next ten days. I have had the time to look at Northern Illinois, however, and this could be a closer game than Bulldog fans may initially anticipate. The Huskies come into Hinkle Fieldhouse this afternoon toting an effective offense and lackluster defense. As bad as Butler has been to start the season with perimeter defense, Northern Illinois has been worse, allowing their opponents nearly 40% from beyond the 3-point arc. Opponents look like they are having their way inside too because the Huskies are allowing over 52% made on 2-point baskets one month into the season. As poor as the Huskies are at defending the three pointer, their ability to score from beyond the arc is on the opposite end of the shooting spectrum. Northern Illinois shoots nearly 42% from three, yet they don’t take many threes. Northern Illinois touts a veteran team composed of mostly juniors and seniors. Eugene German is the go-to guy that takes about one-third of the Huskies shots each game. German does turn the ball over, about one in every five times he possess the ball. Levi Bradley is another large contributor for Northern Illinois. Bradley handles the ball well and he adds another dimension for the Huskies because of his ability to shoot the perimeter. Currently, Bradley shoots above 50% from beyond the arc. An interesting visit from the nation’s leading efficiency ranked player (according to Kenpom.com) in sophomore Rod Henry-Hayes will be a treat. He is ranked so high because he has not turned the ball over and, to this point in the season, has made most of the three pointers he has taken. In fact, Northern Illinois boasts three of the most efficient players in the nation. German currently ranks eleventh for players who are used on at least 28% of possessions during a game. Northern Illinois plays at a lethargic tempo, working their half-court offense a majority of their possessions. German, when provided the opportunity, will take shots from beyond the arc. Although the Huskies shoot threes at a successful clip, three-point baskets don’t make up a large portion of how they score. Butler’s perimeter defense has improved over the past month, however that is in large part due to playing below average teams. The Huskies have three players averaging double figures. Eugene German leads Northern Illinois with 21.8 points per game. In two of his last three games, he has scored 30 and 33 points. Limiting German and Levi Bradley will be keys to Butler’s success. In their most recent game, the Bulldogs outplayed Brown in the first half with what looked like an uptempo offense. It seemed clear the message from the coaching staff was to speed the offense up and get shots off quicker in the shot clock. By halftime, the Bulldogs had grown their lead 36-17. A couple positives in the result were the seven turnovers and thirteen assists on twenty-four made baskets. Keeping the number of turnovers in single-digits is a great sign of growth. Hopefully the Bulldogs continue great play today against the visiting Huskies, a slightly more formidable opponent than Brown. I have the Bulldogs winning at home 75-67. Most would probably say that it makes sense I enjoy following college basketball, due to the glaring fact that I was born in Indiana. I find it goofy being born in a certain area allows for generalizations to be made. I own it though and have fully jumped into the lore that is college basketball. 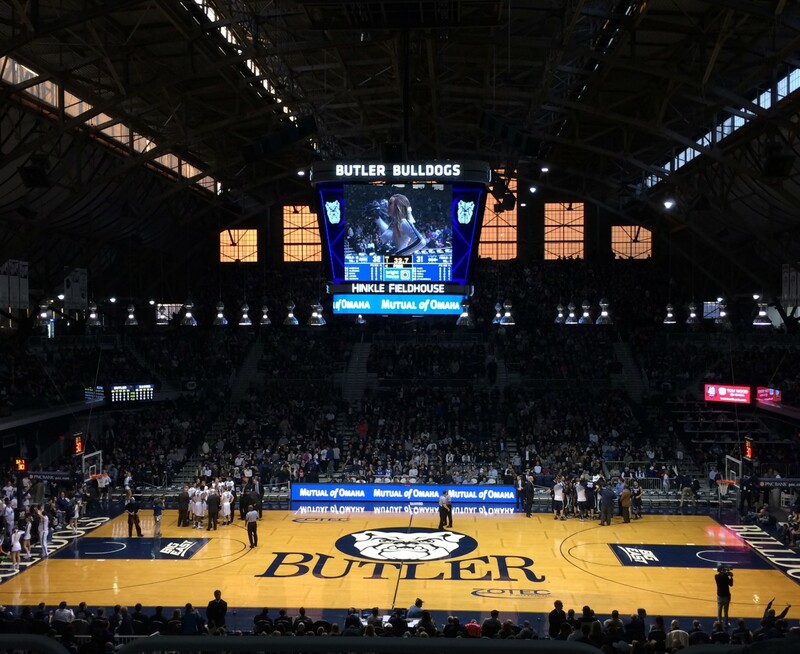 Having said that, I was taken to numerous Butler men’s basketball games growing up in the mid-1990’s. I was fortunate to have been born in an area rich in basketball fanaticism and history. During my childhood, I found a fascination with taking on the role of the underdog. That role is something that the Butler Bulldogs are quite used to. I watched them accept and own that role of underdog as they began a quiet and calculated, yet exciting move into becoming a household name in the month of March. My grandfather is the reason I love Butler basketball. He had been a season ticket holder for a while before he invited me to go to a game with him. As we spent time together at these games, I felt a shared connection with him that I have since felt with the rest of my family and close friends. I was privileged to watch Butler have success from the late 1990’s to present day — mostly sitting next to my grandfather. There isn’t one exact moment I can point to and say, “That is when I began to love college basketball.” It was a love that developed over time. It was through the shared experience with my grandfather, family, friends, and relative strangers even! It was the smell of popcorn and the sound of live instruments from band playing during timeouts. The setting was an influence. There is nothing quite like watching a Butler game on an early Saturday afternoon with natural sunlight beaming through its large, cathedral-esque windows. College basketball is what I look forward to most as the temperature drops and days grow shorter. So, that’s why I chose to write about college basketball. By no means am I the expert on the sport. It is something I enjoy watching and discussing. I love the detailed statistical analysis. Put numbers in front of me and I could look over them for hours. I love the conversation and playful banter that comes with watching the sport. In recent years, I enjoy the parity in the sport. It’s an exciting feeling to watch teams that weren’t given a chance at the beginning of a game walk off the court celebrating victory. It was something I was born into — introduced by my parents and facilitated by my grandpa–I have come to love the game of college basketball and I want to share that passion. So, you can expect updates every few weeks about the college basketball landscape. To be honest, that most likely means recognizable names of colleges. However, as the tournament in March draws near, I plan to look into teams that have a legitimate chance to receive a bid to the tournament. Naturally, there will be Butler specific posts as I have an allegiance to their program. The key for these updates is how much time I have on my hands to type up posts. Until the next post!